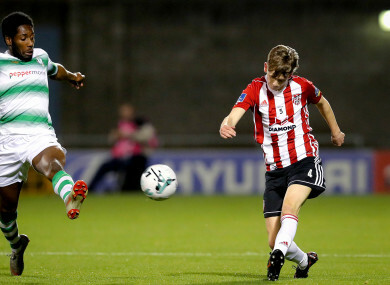 Ciaron Harkin in action against Shamrock Rovers last week. IRELAND U21 BOSS and ex Derry City manager, Stephen Kenny watched on from the stands as the Candy Stripes clinched a hard fought victory over Waterford at the Brandywell. Man-of-the-match, Ciaron Harkin put Derry in front with a clinical finish after 14 minutes. Shane Duggan equalised for Waterford from the penalty spot on the hour-mark after Darren Cole collided with Bastien Hery in the box. Two own goals from Waterford’s Rory Feely and makeshift right-back, Georgie Poynton in the space of 10 minutes gave Derry a comfortable advantage. However, Waterford substitute, Cory Galvin fired in a spectacular effort with two minutes left on the clock but the Blues ran out of time as City made it two wins from two at home. The game sparked into life on 10 minutes when Cole did brilliantly to win the ball from Hery inside the Waterford half. And when McNamee eventually spread play wide to Ogedi-Uzokwe, the Londoner crossed dangerously into the six yard box but Harkin, who got in front of Rory Feely at the back post, couldn’t find that vital touch. Waterford wasted a glorious chance to take the lead on 13 minutes when Zachary Elbouzedi raced clean through on goal but Cherrie saved low to his right before Patrick McClean cleared the danger. Almost immediately Derry were on the attack and after great work from Ogedi-Uzokwe and McCrudden, the ball came to Harkin 12 yards from goal and the midfielder curled his clinical strike into the corner. The Blues pressed for the equaliser and Cherrie once again came to the rescue for Derry when Hery found Drinan in space but the City keeper turned his shot behind at the near post. Waterford were under pressure and Damien Delaney gifted possession to McNamee who played Parkhouse in on goal but his right footed shot was saved by the outrushing Matthew Connor on 35 minutes. McCrudden had a chance to double Derry’s lead 60 seconds later when Ogedi-Uzokwe found him in space at the back post but he sent his half volley high over the bar. From a Waterford corner Derry failed to clear and when Cole collided with Hery just inside the box referee, Neil Doyle pointed to the spot. Up stepped Duggan to tuck away the spot-kick on the hour mark. Derry hit the front on 75 minutes when McClean’s inviting cross into the Waterford six yard box was turned into his own net by Feely and it was no more than the home side deserved. After sustained pressure on the Waterford goal Harkin crossed towards the back post and once again a Blues defender, this time, Poynton, turned into his own net. Parkhouse should’ve put the game beyond doubt moments later when Greg Sloggett found him lurking in the area but he screwed his shot wide. Waterford substitute, Galvin fired a spectacular strike into the top corner past Cherrie to give the visitors hope of a comeback with two minutes to go but it proved too little, too late. Derry City: P. Cherrie; D. Cole, E. Toal, A. Gilchrist, P. McClean; J. Ogedi-Uzokwe, G. Sloggett, C. Harkin (G. Bruna 87), M. McCrudden (A. Delap 70); B. McNamee; D. Parkhouse; Subs Not Used – N. Gartside, C. Coll, E. Tweed, E. Stokes, J. Kerr. Waterford: M. Connor; K. Lynch (G. Poynton 30), D. Delaney, K. Brown, R. Feely; Z. Elbouzedi, S. Duggan, JJ. Luney, B. Hery; S. Twine (C. Galvin 57), A. Drinan (I. Akinade 63); H. Ketro, M. Kouogun, D. Walsh, S. Griffin. Email “Two own goals see Waterford fall to Derry as Ireland U21 boss Kenny watches on”. Feedback on “Two own goals see Waterford fall to Derry as Ireland U21 boss Kenny watches on”.